Traditionally, the West Virginia Legislature is a citizens’ legislature comprised of average citizens representing the interests of the public. Elected officials have backgrounds in a wide range of professions from physicians to educators, coal miners to lawyers, insurance agents to nurses. Commonalities between the lawmakers include their allegiance to West Virginia and their desire to improve conditions for its citizens. On the second Wednesday of January each year, these representatives hang up the hats of their chosen professions and leave the comfort of their own homes to undergo a strenuous 60-day session for the benefit of their constituents. Though the lawmakers are called in for interim meetings and special sessions throughout the year to study various topics, the bulk of decision-making takes place during the regular session. Over 2,000 bills are introduced during each session and approximately 200 make it to the Governor’s desk. The 60-day session may seem brief, but the progress made by these representatives is not to be taken lightly. A typical day for a lawmaker may begin with a committee meeting. Legislators collaborate to form 19 Senate Committees and 18 House committees. Legislation is considered within these committees and amendments and recommendations are presented to the bodies at large. Each Delegate is a member of at least one major committee and each Senator is typically among the membership of two major committees. These committees, including the Judiciary, Education, Finance and Government Organization of either chamber, meet nearly every day, often twice a day, to discuss bills at length. In late morning, the bodies convene for their respective floor sessions. During the floor sessions, resolutions are adopted to recognize groups and individuals. Lawmakers introduce visiting pages and guests to the members. Afterwards, bills placed on the calendar are introduced and others are read for a first, second or third time. Bills being read for the third time are discussed and voted on by the legislators. Miscellaneous business is dealt with and further remarks are made by members. The House and Senate typically adjourn following their morning floor sessions, but as the session progresses, the bodies may go into recess after a morning session and reconvene in the afternoon for a second meeting, as needed. Following the morning floor sessions, lawmakers attend additional committee meeting and public hearings. The most controversial, complex bills may be addressed through public hearings. These public hearings are often lead by sponsors and advocates of the bill and draw attention from the public as well as outside interest groups. Lengthy discussion often causes afternoon meetings and hearings to run late into the evening. At the close of each day, lawmakers return to their offices to respond to a variety of correspondence and prepare themselves for the day to come. To add to their responsibilities, the Capitol Rotunda is at capacity with visitors. Celebratory days at the Legislature such as “Fairs & Festivals Day,” “Corrections Day” and “History Day,” bring people from across the state to the Capitol. Lawmakers are able to meet with some of their constituents and gain a better understanding of what is happening throughout the state. 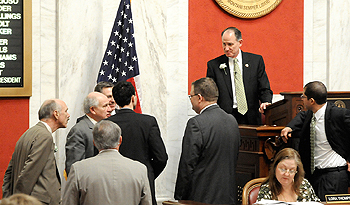 Despite the part-time nature of the West Virginia Legislature, the efforts of its members are quite the opposite. For an intense, productive 60 days, these men and women are swept away from family, friends, work and personal priorities. Year-round, they carry the designation and workload of a lawmaker, recognizing and fulfilling their responsibility to the citizens of West Virginia. House Bill 4087 is in regard to the discontinuance of the severance and business privilege tax on severing timber. The bill details the tax provisions in terms of the rate and measure of tax and the elimination of taxes imposed on the severance of timber. House Bill 4493 would establish special memorial days for veterans. The bill would state the governor could declare March 30 to be Vietnam Veteran Recognition Day, August 7 as Purple Heart Recognition Day, and July 27 to be Korean War Veteran Recognition Day. House Bill 4415 would create a statutory corporation to acquire, renovate and maintain the railroad station building located in Prince, West Virginia once it is no longer used as a railroad station. The building would be modeled in the interest of the public. Senate Bill 4 would declare a child’s right to nurse. The bill also authorizes a mother to breast feed a child in any location where the mother and child have a right to be. Senate Bill 51 would provide for denial of spousal support if it can be proven through DNA evidence a spouse has committed adultery after entry of the divorce decree. Senate Bill 60 would make it a felony to drive a vehicle while under the influence of alcohol, a controlled substance or other drug and recklessly cause serious bodily injury to another person. It would also establish penalties for first and subsequent violations of certain provisions. Senate Bill 110 would modify and increase the membership of the Broadband Deployment Council. The bill would also expand the powers and duties of the Broadband Deployment Council. Senate Bill 212 relates to the disruption of communications and public utility services. The bill would also define terms and establish criminal penalties for disrupting the communications or public utility equipment. Senate Bill 340 would require the West Virginia Secondary Schools Activities Commission (WVSSAC) to promulgate rules that address concussions and head injuries in interscholastic athletes. The bill would set forth minimum provisions to be included in the rules and exempt volunteer health care providers from liability in certain instances. Senate Bill 421 would regulate deer farming as an agricultural enterprise in this state. The bill would also state the powers and duties of the Department of Agriculture, establish the duties and obligation of the commissioner and create an application process. Senate Bill 437 would address the regulation of opioid treatment programs in West Virginia. The bill would also update rules for opioid treatment program facilities to require clinical guidelines, recovery models, education and training requirements for treatment facility staff and treatment limitations and requirements. Senate Bill 564 would create the Aviation Fund and the Fleet Management Office Fund. The fund requires the moneys in these funds do not expire, the funds be used for aviation and fleet management purposes, and costs and expenses muse be borne by the agency or department using the aviation or fleet services. Senate Bill 566 would authorize the Commissioner of Corrections to contract with nonprofit and charitable organizations for work-release and inmate reentry services. It would also allow circuit courts to directly place convicted defendants in such facilities. Senate Bill 624 would provide a method of collection of motor fuel excise taxes when liquefied natural gas or compressed natural gas are used as motor fuel. House Bill 2278 would authorize the use of additional mediums for use in archiving state records as well as allow county historical societies to obtain one copy of an archived state record without cost. House Bill 2657 would create the West Virginia Religious Freedom Restoration Act. The bill would not give any government entity the right to burden a person’s religious beliefs or to deny government funds, benefits, or exemptions. House Bill 2740 would remove any provisions that may prevent the installation and use of commercial or residential solar energy systems. In instances involving a housing development or association, the solar energy systems may be established or removed upon vote of the area’s members. House Bill 4020 would put into place a program to recognize top-scoring students on the WESTEST2 as All-State students. 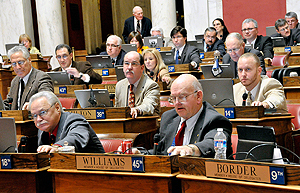 The provisions of the bill would become effective for the 2012-2013 academic school year. House Bill 4028 would give authorization to temporarily suspend the certification or licensure of emergency medical service personnel if the person is believed to be practicing procedures that may create a danger to public health or safety. If probable cause for suspension would exist, an emergency suspension would be issued and a hearing would be held within 10 days. House Bill 4030 would prioritize the partial payment of costs, fines, fees, forfeitures, restitution, penalties or other costs imposed in a magistrate court in civil and criminal matters. House Bill 4037 would give consideration of military training and education when determining professional or occupational licensing. Also, the bill includes legislative finding in regards to the military and lists provisions as to when a licensee can submit a waiver request to certain boards. House Bill 4049 would require that the Department of Environmental Protection maintain an Office of Internal Auditing. The auditor staffed in the office would be required to have at least five years of auditing experience in a government agency. House Bill 4068 would require antique motor vehicles be valued at salvage value for personal purposes and the value cannot exceed $1,000. House Bill 4260 would make changes in order to clarify insurance coverage for autism spectrum disorders. The bill would specify application of benefit caps, add an evaluation of autism spectrum disorder to the specified coverage, and clarify the diagnosis, evaluation and treatment requirements. House Bill 4327 would require pulse oximetry testing for newborns. The test would check for congenital heart defects that can cause severe and life-threatening symptoms and require intervention within the first days of life. House Bill 4530 would create a new section of Code relating to the recovery of expanded net energy costs by electric utilities through the issuance of consumer rate relief bonds. The bill would authorize the Public Service Commission to consider and issue a financing order to regulated electric utilities to permit the recovery of the energy costs. House Bill 4351, the Mine Safety bill, would allow miners to submit anonymous tips about safety issues, require ventilation plans be submitted, and allow families to be part of the interview process should another mining disaster occur. House Bill 4475 would encourage recent graduates to remain in West Virginia by reducing the federal adjusted gross income. The tax credit would be applicable to those who receive a bachelor’s or graduate degree in science, technology, engineering, mathematics, nursing or teaching from any regionally accredited in-state or out-of-state higher education institution or any regionally accredited in-state community and technical college. Graduates must also remain in state after graduation. House Bill 4583 would modify certain deadlines associated with the termination, resignation and transfer of school personnel - and sets the deadline for voluntary transfers to before the beginning of an instructional term.